A look at "The Living Wall" at North Tahoe School in Tahoe City. 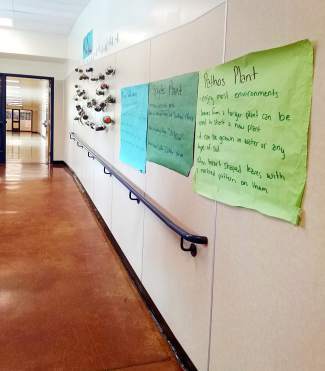 TAHOE CITY, Calif. — Throughout the first trimester at North Tahoe School, seventh- and eighth-grade leadership students have been working toward making their school a plant filled place. The recycled bottles serve as all of the plants’ new homes. The leadership class has planted several different types of plants, some of which include Spyder Plant, Tahoe’s Wildflowers and Pathos Plant. Having living plants hanging in the hallways has benefited the oxygen level and has enhanced student understanding of how to care for plants. It also engages the students in learning about nature and its beauty. This idea began on a scouting mission through the halls of NTS to find the best spots to place the plants. The walls where we were going to hang the plants had to have sunlight, and be far enough away from any heaters or air conditioners. We also researched the best way to place plants on the wall. We decided command strips to hold the wire and the plants up. Then we figured out how to connect plants together. Using wire, we wrapped bottles so they were stacked on top of each other; however, we left room for the plants to grow. Our ‘Living Wall’ has been very successful thanks to our donors. On behalf of the North Tahoe School Leadership class, we would like to thank: Rock and Rose Inc. for donating wildflower seeds; Tahoe Tree Company for donating soil; The Villager Nursery for donating fertilizer and bumper crop, the North Tahoe School Student Council for donating money for supplies; and the students at North Tahoe Middle and High School for donating their used plastic water bottles. Our final appreciations extend to Principal Chad Lindeen and Head Custodian Beto Alcaraz-Ochoa for supporting this school improvement. Students have been working consistently on this project for three months, and we hope the hard work pays off as the year continues. 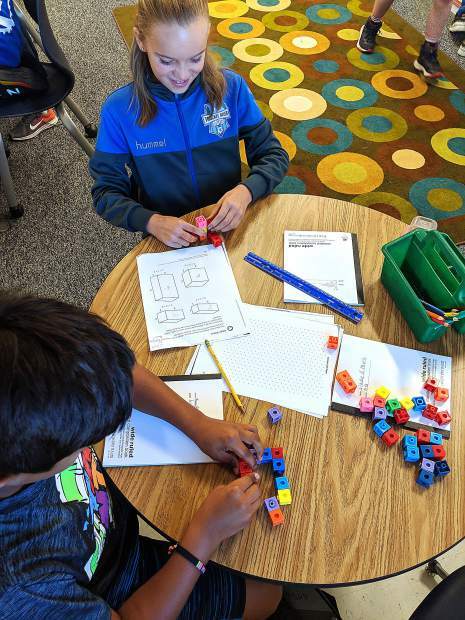 Mera Schoonmaker is a seventh-grade Student and Casey Garrity is an eighth-grade student at North Tahoe School.